​Pinterest is a platform on a mission. Documents obtained by TechCrunch late last year showed that the social platform aims to be generating more than $2.8 billion in revenue by 2018. Pinterest's forecast for full-year 2015? $169 million. That leaves a lot of ground to cover in only three years, and as such, you can expect the visual-based platform to be ramping up its efforts on all fronts as it looks to capitalize on its 100 million monthly active users and the high purchase intent of that audience. We've already seen Pinterest moving on this - the platform's been active in recent months, introducing new features like Cinematic and Buyable Pins and their advanced image search tool. All of these additions are relatively small, in isolation, but when viewed from a wider scope, you can see how the platform is evolving and moving to become more than a social platform. In fact, one could argue that Pinterest's actually shifting further away from being a "social" network and further towards becoming a dedicated eCommerce platform - a sort of online mall, curated by millions of stores. Indeed, Pinterest's own stats show that 75% of saved Pins come from business boards. Such usage trends show that the 'why' of Pinterest is changing, the logic behind what brings people to the platform for seems to be shifting to a new dynamic, and if Pinterest wants to capitalize on that and reach its ambitious revenue target, it needs to evolve in step. But of course, the first step in all of this is the user experience - people can't use Pinterest to search through and buy more products if the system itself isn't user-friendly. On this, Pinterest is now in the process of rolling out its biggest engineering and design overhaul ever. As announced on the official Pinterest blog today, the platform's undertaken a complete re-design of their mobile app from the ground up, the results of which are now available for users (starting with iPhone and iPad) to test. "With so many people using our app, it's more important than ever to make sure it works great for everyone - no matter where you live, what language you speak or how old your phone is. So we decided to give things a complete overhaul, from what our app looks like to how fast it works. - A new modern look that lets you focus more on Pins. - Universally readable, in 31 languages. Kanji, Roman, Cyrillic-now our app is legible no matter what language you read or what screen size you have. - Crazy fast loading, for everyone in the world. When you open the app, your home feed now loads up to 3 times faster." Load time is obviously a big focus - as noted in the above GIF and in the accompanying notes, Pinterest's keen to make the user experience as smooth and friction-free as possible, with the new app loading content up to three times faster than previously. But what's particularly important about the re-design on this front is that the app not only loads faster and is more functional, but that it's able to perform at the same levels on older devices, particularly those in use in emerging markets. In an interview with Wired, Pinterest CEO Ben Silbermann noted the need to focus on markets outside the US - while the platform's been growing at a steady pace within America, only 45% of the people using it are outside its home nation's borders. As part of their efforts to re-build the mobile app, Pinterest conducted research into how to boost take up amongst users in other markets, setting up offices in the UK, France, Germany, Brazil and Japan, while also conducting studies into less developed markets. Given the comparatively slower international take-up of the platform, at least when looking at Twitter and Facebook at the equivalent stages of their growth, there's still a heap of potential for Pinterest to build upon their audience in these markets, and the new app is a step in that direction, focused on delivering a better user experience across a wider range of devices. When you consider that in the context of potential ad growth - Pinterest says it quintupled its ad sales in the US last year - you can start to see why some market advisors and analysts remain bullish about the platform. The visual interface of the new app is completely new, though the changes a relatively subtle. 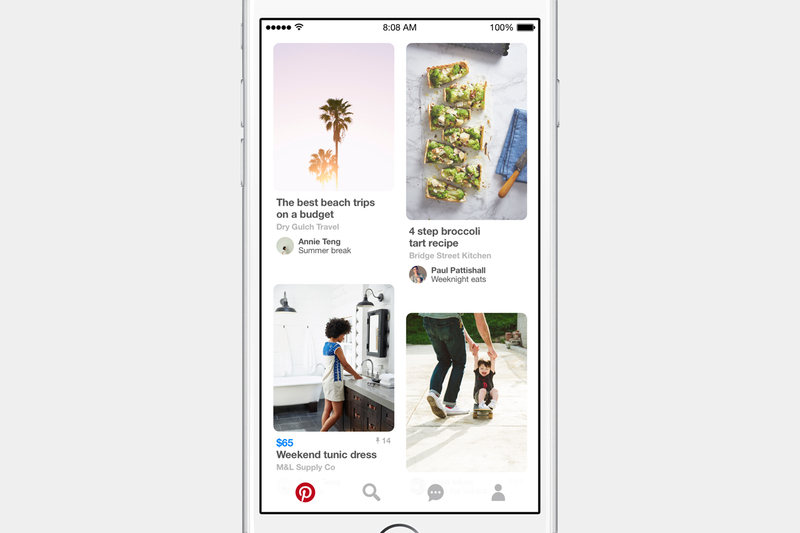 Pinterest's aim was to create a sleeker, more minimalist approach in order to put more focus on the Pinned content, as opposed to the function icons and buttons on the page. Helmed by former Facebook engineer Scott Goodson (who created 'Paper'), the technical advances of the system are significant, yet they're designed, essentially, to not be seen. As such, it's not like there's a whole range of new toys and features to play around with, it's Pinterest as you know it, but better. The new framework will also enable Pinterest to develop and implement new features faster than ever before - and if they want to hit that lofty revenue target, this'll be important. On this, it'll definitely be worth paying attention to Pinterest over the next 12-18 months - with a new, easier to scale system in place, and some major revenue goals to hit, there's likely to be a lot of changes and updates coming. And if those changes resonate with users, it may become a far more important player in the wider social landscape. How big a player, exactly, Pinterest can become is hard to say. For their part, Pinterest says it wants to become the "dominant global visual search engine", combining the "scale and engagement of Facebook and the purchasing intent of Google". Given their current position, it's not beyond them to achieve both, but it'll take a strong push, some significant shifts to make it a reality. But if they can do it, Pinterest will definitely become a more important platform to consider. Definitely watch this space.